For most applications, the advantages of a THREE-WIRE alternator will far outweigh the little time saved with a ONE-WIRE installation. Both types have the voltage regulator in the alternator, but there are important differences between the ONE-WIRE and THREE-WIRE systems. M.A.D. Enterprises does not sell alternators, and we never have. Therefore we have no reason to slant this story. However, advantage of the THREE-WIRE system over the ONE-WIRE system is exactly why we made our part#ALT-1, alternator wiring kit, beginning back in 1989. (Rather than simply sell ONE-WIRE alternators–which would have been very easy for us to do.) 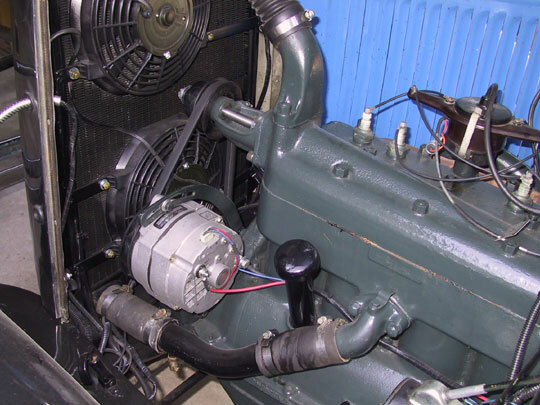 The THREE-WIRE advantages are even more important in recent years–More powerful alternators are often installed on Hot Rods and they must support a more power hungry electrical system. This is a fairly involved topic, and this feature contains issues that have never before been directed at the High Performance automotive industry. It was posted for the enjoyment of those who enjoy learning how things work. For those would like the advantages of the THREE-WIRE without caring much about how it works, our part # ALT-1, alternator wiring kit has pleased thousands of people in the years we have sold it. The kit makes it simple to wire the THREE-WIRE system without knowing why or how the system works, and we have kept the price tag low for the kit too ($27.95). Sometimes we think performance is pretty good, but we never know how good performance really could be until we test it or compare it to something better. It’s surprising how much stronger HEI system (ignition) is at 14 volts, compared to operating at 11 or 12 volts. And the same is true with the headlights, the strength of electric radiator fans, and other items. Information in this feature applies to all alternator systems, not just the 10SI and 12SI Delco systems. The real story STARTS here! (1) Even with a VOLT gauge at the dash, it’s a good idea to also have an alternator Warning Light. (We can have both.) Warning Lights are easily added at custom dash panels and at dash panels that did not come with an alternator Warning Light. Warning Lights attract attention immediately. With only a gauge at the dash it’s easy enough to be in real trouble before an unusual reading is noticed. The best is to use a Warning Light and a gauge. If the Warning Light comes ON while driving, watch the Water Temp gauge! The belt may have tossed or there may be other problems, which have stopped turning the water pump. 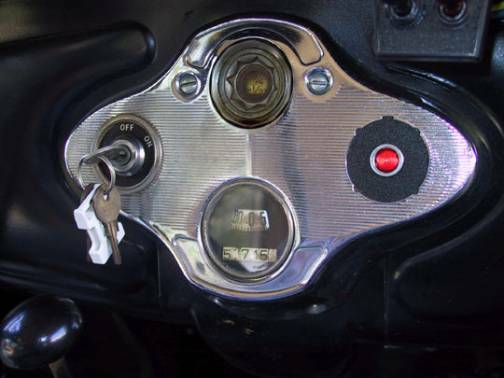 If the ignition is switched ON without the engine running (for service work or for any other reason) the warning light is a good reminder that the ignition is ON. (2) “Remote Voltage-sensing” is a must for good electrical system performance with most factory-original type wire harness designs. We have explained the Remote Voltage-Sensing function in our Tech Section, where a feature essay is dedicated to this topic. But because knowledge of remote voltage-sensing is important to this comparison, here’s a brief explanation. The alternator is the source of power used to operate the ignition system, lighting, and other electrical system parts. And the parts will deliver best performance when operating at about 14 volts. The voltage regulator will always attempt to maintain the electrical system voltage at about 14 volts. But the original wire harness will feed power to these parts from a “main junction” in the wiring, which is often far downstream from the alternator. The voltage regulator can maintain 14 volts at the “remote main junction,” if we give the regulator opportunity to read “voltage-sensing” from the junction. The ONE-WIRE, without REMOTE VOLTAGE-SENSING option, as an “intended up-grade” from a 55Amp externally regulated to a 100Amp ONE-WIRE can result with dim lights, weak ignition, and weak performance in general. (Especially so when a factory-original” type wire harness system is used.) And at M.A.D. we have received many phone calls from people who have experienced the result of such conversions. (3) The THREE-WIRE models are the most readily available, because for many years they were factory installed on nearly all makes and models of GM cars and pick-up trucks. (4) POPULARITY as a replacement service part and also with retrofit up-grades has made the THREE-WIRE 10SI and 12SI models the least expensive alternator/regulator system in the industry. 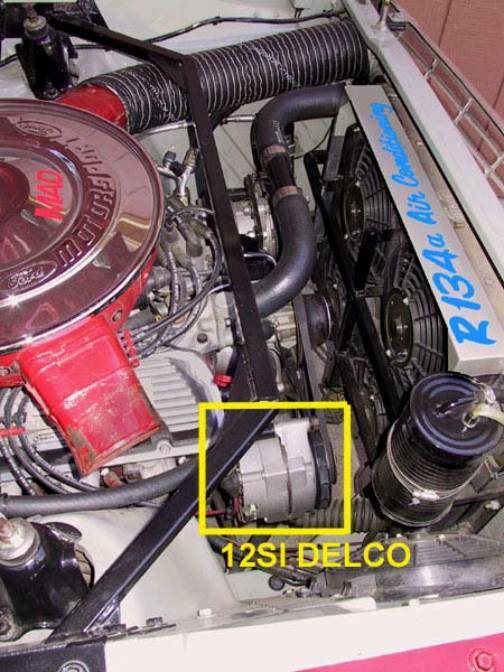 The 12SI Delco alternator is a very good up-grade for many makes and models. We have all seen them used as an up-grade on Chevy and other GM cars. Here’s one that has performed very well on a FORD, for many years and lots of miles. At the time of this writing it still serves as a daily driver. Often this alternator has had to work hard, and sometimes for long days. There are four electric radiator fans (all come ON at once), another fan on a transmission oil cooler (foreground), a powerful air conditioning system, a small sound system, electronic ignition, Halogen Headlights on relays, and there are two batteries that must be maintained. It’s a stock, DELCO, THREE-WIRE alternator, and was wired using M.A.D.’s part #ALT-1 kit. 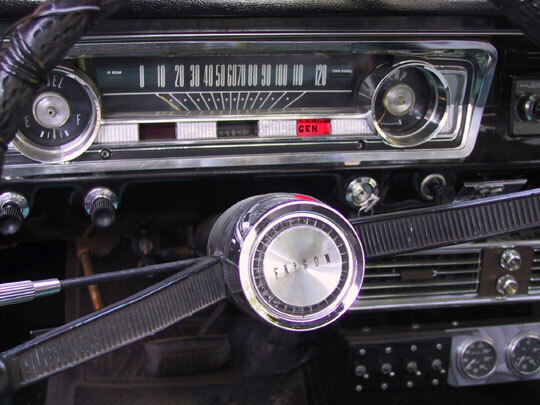 The system also operates the factory “GEN” warning light at the dash at this ’64 FORD. The FORD (shown in previous photo) is a ’64, which came with a generator, not an alternator. It’s a nice touch to make use of the original Warning Light at the dash, when using a stock dash system. And this GEN light works perfectly with the THREE-WIRE 12SI, wired using M.A.D.’s part # ALT-1 alternator wiring kit. (Shown with Ignition Switch ON, engine stopped.) The THREE-WIRE system will also support the factory “ALT Warning Light” when converting from the externally regulated alternator systems.